Golden rod, the name of numerous plants whose showy heads of flowers, waving like golden wands, make bright and gay the sides of roads, hills, and gravelly banks in the autumn. Although the general appearance of the racemed or else corymbed heads, which bear the florets, is diverse, yet the flowers themselves differ only from the asters in the smaller heads of (except in one species) yellow flowers. The genus is mostly North American, there being about eighty species, all of which but three or four belong to this country. It grows in thickets and woods, and formerly was much used in medicine. Its principle is astringent and tonic; the leaves and flowers, however, were thought aperient. It occurs in the northern regions of America, but under very dissimilar forms. Perhaps the most interesting species is the sweet goldenrod, with a slender stem two to three feet high, often reclined; the leaves linear-lanceolate, entire, shining, covered with pellucid dots, which secrete a delicious anisate oil; the flower heads in racemes spreading in a one-sided panicle, the flower rays rather large and conspicuous. It may be occasionally found in rich, shady woods. An essence distilled from the leaves has been used to relieve spasmodic pains. One of the earliest indications of the approach of autumn is in the flowers of the white goldenrod, the only species which has white flowers. Next comes into yellow bloom the tall Canadian goldenrod, and, following this, the gigantic goldenrod, and the tall goldenrod, names singularly misapplied, as the altitude of both is not unusual. Afterward may be seen Solidago arguta and other species, until the lingering florets upon the downy goldenrod indicate the near approach of the cold. 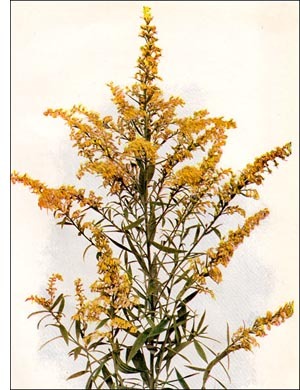 The goldenrods generally affect dry and sterile soils, though some are found in bogs and moist places, and range from alpine heights to the very margin of the sea.